Impossible to be bored in Charlevoix! Katabatik will satisfy those who are looking for adrenaline and discovery ... Take advantage of their experienced guides and enjoy a sea or river kayak trip, go paragliding or treat yourself to the experience of canyoning in the most beautiful corners of the region. For a family stay that moves, make a visit to the adventure park The Palissades. Located 20 minutes from the Auberge des Peupliers, the park will take you through a multitude of emotions through activities of zip lines, climbing and via ferrata! The Hautes Gorges National Park offers to nature lovers breathtaking landscapes. With its high elevations, its mountains cut steeply and the presence of the river Malbaie, this site, formerly known for its activities log drive, now offers the possibility of several outdoor activities. Fishing, river boat, rabaska and hiking are few examples available! The Grands Jardins National Park is one of the central areas of the Charlevoix Biosphere and allows people to discover the northern landscape. For a moderate tempo, try the trail called Mont du Lac des Signes and enjoy a beautiful 360 degree panorama at the summit. Baie des Rochers, up to now an unknown site, offers a beautiful place to indulge in photography. Only few minutes away from the Auberge des Peupliers, the detour is worth it. Several kilometers of trails are available and magnificent points of view of the river await you. Whale watching is aspecial and unique experience in Charlevoix. It's definitly a must-see activity for the region. Whether in the comfort of an observation boat or, for the more adventurous, in a Zodiac boat, encounters with these sea mammals will dazzle the whole family. If you get the chance, visit the beautiful village of Tadoussac to complete your day! For thrill seekers, here is the activity for you! Le Paradis du Quad offers A.T.V rentals and guided expeditions in the most beautiful corners of the Charlevoix region. Even children (minimum of 5 years) can join the trip! Entre Monts et Marées- Horseback riding – Pick a package and save money! A horseback ride on the beach makes you dream? Just 25 minutes away from the Auberge des Peupliers, the riding center Entre Monts et Marées can make it reality for you. Also available: forest or mountain trails. Tadoussac is a lively touristic village during the summer located 50 minutes away from Auberge des Peupliers. Enjoy the day by walking through and enjoy the moment by releving the days of the fur trade, treathing yourself to a ride along the river banks or by learning about the marine world by visiting the center interpretations of sea mammals. It can be a busy day, enjoy breakfasts at Auberge des Peupliers before leaving! Looking for a unique experience? Héli-Charlevoix can help you by discovering the breathtaking scenery of Charlevoix in one of the most original ways: by helicopter! The several routes available will show you, from the air, the beautiful landscapes of the region and a unique perspective of the St. Lawrence River. Either during summer or winter time, the Casino de Charlevoix is a must for gamers. Find entertainment, media experience and courteous and friendly service under one roof. Go on a Friday or Saturday and let yourself go on the rhythm of live musical performances of the Bar! 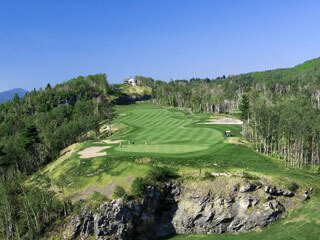 Those who love golf will be pleased to learn the presence of two magnificent golf courses at La Malbaie. The Golf Club Murray Bay, one of Canada's oldest golf courses, if not the oldest, offers a 9 or 18 holes and view of the St. Lawrence River. The renowned Golf Club Fairmont Le Manoir Richelieu, for its part, totals 27 holes of high caliber and offers a different experience by beginning your day with a golf cart ride crossing a scenic trail leading you to the main golf clubhouse.